Janie Bress - My North Shore Blog: 6 Eco-Friendly Ways to Stay Cool This Summer on the North Shore! 6 Eco-Friendly Ways to Stay Cool This Summer on the North Shore! Summer is a great time on Chicago’s North Shore with many great outdoor activities, festivals and other opportunities to get out and enjoy the vibrant North Shore communities. Whether you’ve been a North Shore resident for years or are new to Chicago’s North Shore, you’ve probably noticed our unusually warm season! Having lived in the North Shore and working as North Shore Real Estate agent for over twenty years, I can attest that you’re never quite sure what each season will bring. Yet this summer's warmer temperatures has many concerned about their utility bills and the affect on the North Shore environment while trying to keep cool inside. I thought it would be helpful to let you know of some cost-effective and eco-friendly ways to keep cool the rest of this summer on the North Shore. Take a look! 1. Close your windows- It may seem counterintuitive, but opening the windows will often make your North Shore home warmer, not cooler. Open your windows at night if the air outside is cooler than inside, and close them – along with blinds and shades – before the sun hits your house in the morning. When night falls, open windows wide, particularly those oriented toward prevailing winds so you can take advantage of cross ventilation. You may also put houseplants – particularly larger potted trees – in front of sunny windows to absorb some of the sun’s energy. 2. 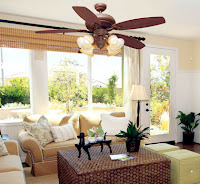 Use fans strategically- Using ceiling fans or stand alone fans can create a nice breeze in a room and help keep you cool. If you’re using ceiling fans, make sure it’s running in the right direction, so that in the summer the breeze is blowing down, not up. Remember to turn fans off when you leave a room since they are made to keep people cool, and are not made to cool an entire room. If you’re buying a new fan, buy an Energy Star fan which will use 50% less energy than other models! 3. Cook (or don’t cook) a cool meal- Just as drinking an ice cold lemonade cools your body, eating cold food helps keep your internal temperature lower on a hot day. If you do cook, use the grill or the microwave, or else you’ll heat up your kitchen from using the oven and stove. And remember, kitchen appliances aren’t the only devices that give off heat; limiting your use of electronics will help keep your spaces cooler. 4. Shut off the lights- While modern lightning, like compact fluorescents and LEDs, are more efficient, incandescent light bulbs can produce as much heat as they do light. Energy Star-rated light bulbs produce 75% less heat, so consider that when replacing bulbs. It’s always a good idea to shut off lights to save energy, it makes a big difference on hot sunny summer days. 5. Go for a swim or take a cold shower- It may sound obvious, but it’s worth saying: If you’re hot, cool it off by immersing yourself in cold water. Jumping in your pool or even a cold shower will immediately cool down your core body temperature. 6. Plant a tree (or two or three) strategically- Your North Shore home may get hot because the sun beats down on it relentlessly on hot summer days. Let nature help reduce your energy bills by planting deciduous trees on the east and west sides of your home; in the summer, their broad leaves will shade your house. Also consider planting trees or shrubs to shade high-heat areas – air conditioning units that emit heat, for instance, and driveways and walkways that absorb it. I hope these six simple tips help you as you think about energy efficient ways to stay cool in your North Shore home this summer! As always, if you have any questions about living in Chicago’s North Shore, would like information about the North Shore Real Estate market or are ready to begin your home search; please contact me! I’m here to help in anyway I can and guide you through each step of buying a North Shore home.